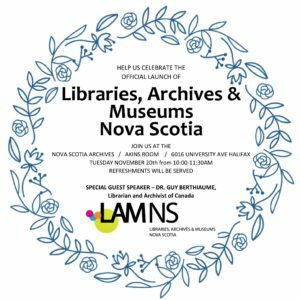 Join us at the Nova Scotia Archives Akins Room (6016 University Ave.) on Tuesday, November 20th from 10:00 – 11:30 a.m. to celebrate the official launch of Libraries, Archives & Museums Nova Scotia. Dr. Guy Berthiaume, Librarian and Archivist of Canada, will be our special guest speaker.